See San Francisco at your own pace on a hop-on hop-off coach tour with several route options. A double-decker bus, featuring live narration, takes you to major attractions including Fisherman's Wharf, Haight Ashbury and North Beach. Redeem your voucher at any of the 24 route stops with an instant-access ticket. Alternatively, cross the Golden Gate Bridge and discover what Sausalito has to offer. Select a 1-day All Loop Pass or a 2-day All Loop Pass including Night Tour ticket. Ride on a double-decker bus as you listen to facts about San Francisco's most popular neighborhoods and attractions. You can hop on and off the double-decker bus as many times as you like, departing from any stop at 15- to 20-minute intervals throughout the day. In the summer, the top deck is open, and during winter, clear screens shelter you from the cold and offer unobstructed views of the city. The San Francisco loop will take you across 24 stops where you can automatically redeem your voucher. With 1- or 2-day City Loop passes available, you have plenty of time to explore San Francisco at your leisure. If you miss something on your first loop of the city, simply re-board the bus and go around again. The Sausalito Loop pass gives you the option of simply taking a trolley tour, crossing San Francisco Bay via the Golden Gate Bridge. 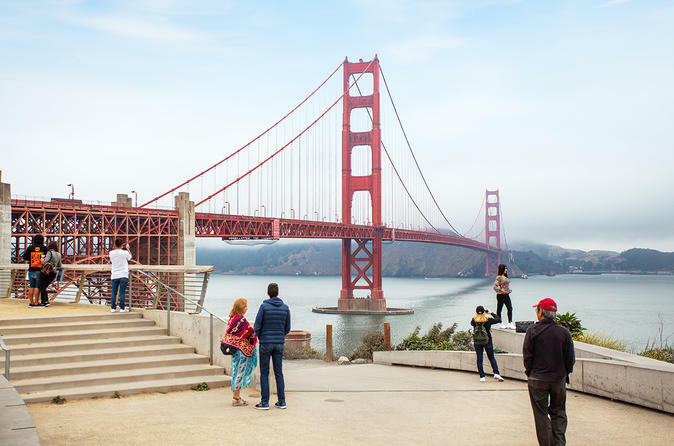 Or upgrade to the 2-day All Loops pass and enjoy two days of hop-on hop-off privileges that combines both tours with a night tour of San Francisco.